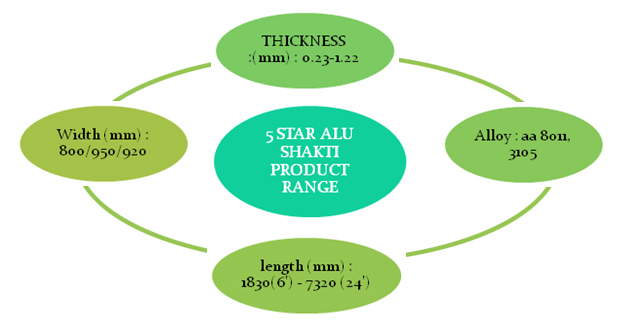 Brand Attributes of 5 Star ALU Shakti 5 Star ALU Shakti Roofing Sheet is Available in Accurate thickness & length. WHY CHOOSE MANAKSIA 5 STAR ALU SHAKTI(DURALAST) ROOFING SHEET ? More profile option > circular (Sinusoidal), Trapezodial & tile. Wide choice, Plain finish,Diamond embossed /Stucco embossed, Ral compliant different colours via state - of - the - art coating line. The only company to offer diamond pattern embosed roofing sheet which make the sheet strong. Market leader for roofing sheet ION African and Middle Eastern countries .